Great response to the last Natter – many of you liked the article by Kate Sexwale. I did err in stating that Kate was Tokyo Sexwale’s daughter – she is in fact the daughter of Tokyo’s brother. I trust that does not detract in any way from the content of the letter. I would like to once again thank all of you who take the time and make the effort to contribute opinions, articles and thoughts for inclusion in the Natter. You help to make a newsletter that is worthy of reading and that, hopefully, sometimes, puts a smile on readers faces. Please keep your contributions coming! Kathy Hardy's "O, to live in the country" contribution elicited a response from Manyanaflora Farm in the form of an article by Bill Bonner (Daily Reckoning, Oct 30 2012) that is worth presenting in full. The great storm continues to soak us, buffet us, and find the leaks in our souls. Yesterday, there were almost no cars on the roads... only a few people in the office...and only a few restaurants still open. "You better make sure you have provisions stocked up," said a nice man on the TV. "Because there are almost certain to be power outages... and given the size of this storm, it could be days... or even weeks... before power is restored." We stopped by the liquor store on the way home. A group of four women were seated at the table in the center of the store. Otherwise, the store was empty. The streets were empty, too. "Hey, a customer!" one said. "Good to see you," said another... "We've decided to drink our way through the storm. Wanna join us?" We bought a case of wine. Better safe than sorry. But you have probably heard enough about the great storm. And you're probably wondering what we had in mind. Yesterday, we promised to tell you why economists and policy were jackasses. We can't remember what we intended, but this blank it is easy to fill in. Let's begin by looking at an economic disaster area: Greece. It has a per-capital GDP of about $29,000 compared to nearly twice as much for the US. One out of four Greeks is unemployed. Half of young people are jobless. And the country is broke. Only the kindness of strangers in France and Germany keeps the lights on. An economist would use a technical term to describe it - 'basket case'. But let's look more specifically at a Greek... let's look at Mr. Stamatis Moraitis. Recently, he was the subject of an article in the New York Times. A remarkable man, he was diagnosed with terminal lung cancer in 1976. Given 9 months to live, he decided to economize on his own funeral. In the US he figured it would cost $2,000 to put him in the ground. In his native Greece, on the other hand, he could be planted for less than $200. This seemed like such a good deal, Mr. Moraitis could barely to take advantage of it. But as it turned out, his penny pinching seems to have saved his life. Thirty six years later, he's still alive. Yes, the Greek beat cancer. The poor grave diggers got no tip. The undertaker delivered no bill. The children got no inheritance. There being no deceased, his house was not put on the market; so, no sales commission was earned... no remodeling was done... no new kitchen was ordered... and no moving company was engaged. In short, Mr. Moraitis cheated the economy out of a boost. Not only that, but reading further, we discover that Mr. Moraitis lives on a poor island, Ikaria. Not only that, he seems to have disappointed economists at every turn. He didn't build a new house; he moved into a small, cheap, old house with his parents. No new furniture. No new appliances. No new granite countertops. The man is practically an anti-consumer. He makes his own wine and tends his own garden. No wonder the Greek economy is so weak! Despite having terminal cancer, he sought no medical treatment. No chemotherapy. No radiation. No drugs. In short, he threw no bones to the housing industry. None to the health industry. None to Home Depot. Nor to Best Buys. Nor any other buys. Pity the poor islanders. Ikaria is a small place, with just 10,000 Greeks. A bum economy. And nothing to do. No malls to go to. Few jobs; unemployment on Ikaria is about 40%. Want a fancy restaurant? Forget it. Want a fast car? Nowhere to go with it on the island. So, what do residents do? Well, they tend their gardens. They drink a lot of wine. They visit with each other... often until late at night. ... their daily routine unfolded... wake naturally, work in the garden, have a late lunch, take a nap. At sunset, they either visited neighbors or neighbors visited them. Their diet was also typical: a breakfast of goat's milk, wine, sage tea or coffee, honey and bread. Lunch was almost always beans (lentils, garbanzos), potatoes, greens (fennel, dandelion or a spinachlike green called horta) and whatever seasonal vegetables their garden produced; dinner was bread and goat's milk. At Christmas and Easter, they would slaughter the family pig and enjoy small portions of larded pork for the next several months. Local women gathered in the dining room at midmorning to gossip over tea. Late at night, after the dinner rush, tables were pushed aside and the dining room became a dance floor, with people locking arms and kick-dancing to Greek music. They spend their days in the sun and their nights in merriment. They beat cancer. And they seem to live a long time; Ikaria has one of the highest concentrations of 100-year-olds in the world. But their economy is not growing. "Hi Mark, just a comment on the Kathy Hardy piece. We do not live in a village... NAPIER IS A TOWN.... Thank you also for the letter written by Kate Sexwale. A sentiment truly felt by many... Keep it coming." 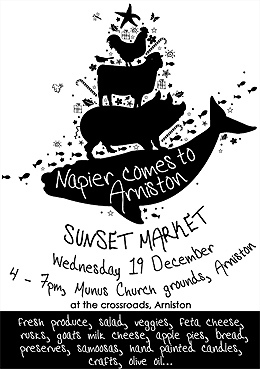 Most people driving through Napier in December to Arniston have little idea how rich are our offerings of food and crafts - and this is our opportunity to showcase what we can do! And before they leave to go home, perhaps they will come through and sample our delights! Those who have been at the sunset market in the past couple of years have had great fun in the grounds of the Munus Hall in Arniston, late afternoon to 7pm. Visitors, who have had a fine day (usually!) in the sea and sun, enjoy finding last minute Christmas presents, scrumptious edibles, fresh produce and all the stuff not readily available in Arniston. This year there is a Church bazaar in the morning at the Munus, and our market can be set up after that. If you want to market your home made goodies or crafts, please give Carol a call 028 423 3761 - there is a limit to the number of stalls and we will try not to duplicate too much. As part of the worldwide 50 year celebration of the death of Edith Piaf, Pascal’s of Napier is hugely excited to welcome back Daniele Pascal in her new show, “Piaf – a passionate life”. Daniele starts off her international tour right here in Napier, where you can immerse yourself in the sometimes haunting, sometimes heart rendering lyrics and music of one of the greatest and most famous French singers ever. Tickets are R225 per person and include a two course meal. Saturday 15 December. Only a limited number of seats still available. Book now- 028 423 3146. Further to the information about the above which was sent out a few months ago, after an initial hiccup regarding the placement of the recycling bin which was donated to Napier by Woolworths, it has now been placed in the entrance to the OK in Napier. Please use it to deposit your used energy saving globes (either in their boxes or wrapped in a plastic bag) and batteries: these all contain heavy metals and should not be thrown away with normal household refuse. The bin will be emptied regularly and the contents taken to Woolworths Hermanus from where they will be collected for safe disposal. Please- can you help us!!! The Child Welfare Charity Shop needs donations of stock. Since moving to the new premises next to Absa Bank (heartfelt thanks to Absa management for making the premises available to us at no cost! ), our turnover has increased tremendously, and, stocks are running low at a time when our customers are frantically searching for everyday items, and, affordable gifts for their families. We will accept anything you have to offer- any household items, bedding, curtains, magazines, books (selling particularly well!) and, our Klerekas would love to have your unwanted clothing especially childrens wear, which is desperately needed. Whatever results from your Springclean, declutter effort or scaling down exercise we and our customers need! Donations can be left at the Shop or Klerekas on Fridays from 1 to 4.30, at the Child Welfare office in business hours or, please, phone John Cook on 0845885747, and he will arrange to collect whatever you have, big or small. Do browse the articles for sale on Friday afternoon- you may just find the treasure you have been seeking, or, a book to while away the weekend. The lucky ticket number for the quilt raffle will be drawn on the 27th November at Pascal’s of Napier at lunch time. Winner will be notified. Anything to sell or swap? Let the Natter know and we’ll find a buyer or swapper! People will talk about you when they envy you and the life you lead. Let them. You affected their life. Don’t let them affect yours. Anon. A great week to you all!